Mint & coriander leaves 1/4 cup or less. Heat ghee in a vessel or pressure cooker,add cinnamon,clove and cardamom let them pop. Then add cashew nuts and fry lightly. Add sliced onions fry till onion turns golden brown,and add ginger-garlic paste and fry till raw smell leaves. Then add green chillies and min-coriander leaves stir well and fry for a minute. Add 2and 1/2 cup water and enough salt stir well and allow to boil. Mean while heat a tsp of ghee in a pan and add the soaked and drained rice and fry well. When the water starts boiling add the fried rice and stir well and cook till rice is done. Now the ghee rice is ready to serve hot with any veg curry or aloo kurma. This is a kids special recipe...mild or less spice..more flavor . 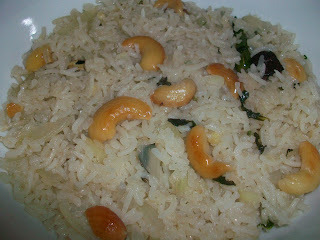 Pack for their lunch box with potato fry or their desired veg ..they luv to eat this ghee rice. 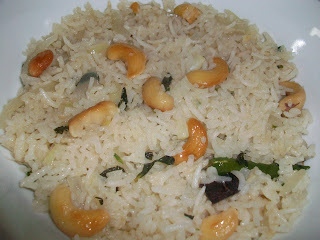 U can make this rice for party and any other occasion also and serve with spicy curry or kurma. For 10 People..i am giving the app measurement..but definitely can served for 10 or more people..
green chilli - 12-15 no. Hope this helps...If you try please don't forget to share your feedback. Wish you Good luck !